However, the biggest concern is that these species possess a higher potential for developing herbicide resistance compared to other pigweed species. Resistance to glyphosate has developed in Wisconsin and other states and continues to expand for this herbicide as well as other modes of action. In fact, nearby states now have waterhemp populations resistant to more than four different modes of action. Multiple modes of action resistance have also been reported for Palmer amaranth which has become a nuisance in other Midwestern states south of Wisconsin. Palmer amaranth has been spreading north and found to be in a few counties in the southwest/central Wisconsin region (see map below). As concern exists on the spread of these species in Wisconsin, we conducted a survey of these two species in Wisconsin corn and soybean fields with the assistance of DATCP. Waterhemp, was on average present in 5% of Wisconsin fields sampled. Comparing results to a survey five years ago, we did not find an overall increase in this plant statewide, but did within specific regions of the state: northcentral, northwestern, and southcentral. Within these regions waterhemp presence was in over 10% of fields sampled. In contrast no populations of Palmer amaranth were discovered. While 474 fields were sampled, tens of thousands of fields exist throughout the state. This randomly sampling alone is not an effective method to detect early populations. We require active monitoring and reporting by YOU! Active monitoring has allowed us to better understand distribution of waterhemp and Palmer in Wisconsin. To date this is our current knowledge of distributions for both of these species. 4) Identifying Pictures of the pigweed, including a picture of the whole plant, a picture of the plant stem, and a picture of the leaf and petiole (leaf stem) also are helpful to verify populations. 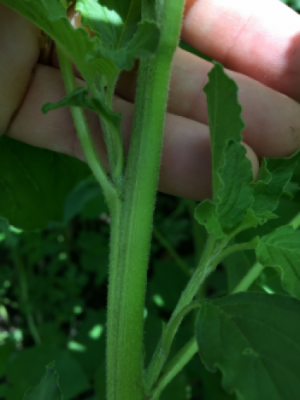 (see images below) Check the website if you need help distinguishing identifiable features present on these pigweeds. Include one close-up picture of the stem to show it does not have hairs. Include one close-up picture of the leaf shape and petiole (leaf stem) folded over the leaf to show whether the petiole is shorter or longer than the leaf. 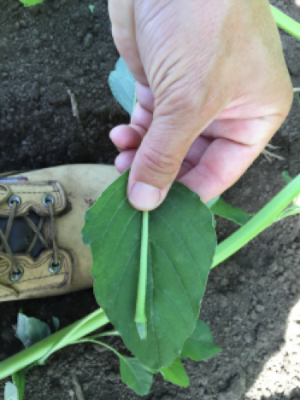 It is our hope that this information in combination with other efforts to identify and report problem pigweeds will assist in early detection of new populations in Wisconsin and encourage management before they are spread. This information will also help us to better understand what factors are driving spread. Check back on the First Detector Network website periodically to find more information regarding the flowering stages of these pigweeds along with an informational video about why we need to care about herbicide resistance in these pigweeds.